The boys over at UP ARMORED USA sent us a few pictures of their custom outer tactical vest OD green taken during one of their Defensive/Combat Tactical Shotgun coarse. They had NIJ style cut armor and needed a way to get their armor into a OD green outer tactical vest and be able to add hard plates. These guys offer a variety of training classes/coarse that can be customized for individuals or groups. We were able to build the carriers to their specification. They need an outer od tactical carrier with molle on the back and plenty of velcro on the front and back. The carrier have front and back internal pockets so they can up armor if needed with hard plates. 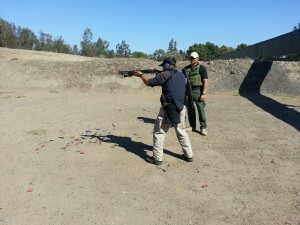 Custom armor tactical vest are our specialty. In fact, that's how we got our start. 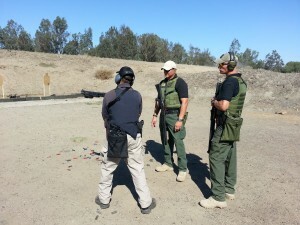 If you are having a difficult time finding a replacement outer tactical vest for your armor give us a call. 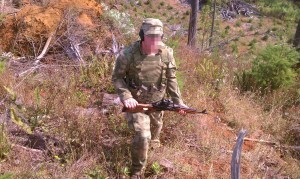 We currently offer custom carriers in Multicam, A-TACS AU, A-TACS FG, Coyote, Khaki, Ranger Green, Woodland and Black. If you want to upgrade you BCS chest rig you need to check out our new padded harness. The padded harness works with all of our chest rigs. 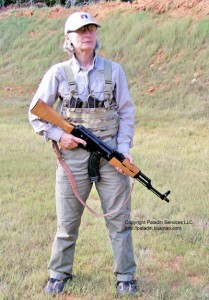 Janet Katz of Paladin Services LLC runs a Multicam low profile AK47 chest rig 3 mag versions during her rifle training courses. Janet admires the low profile rig and says “ it is perfect for women and smaller framed individuals”. 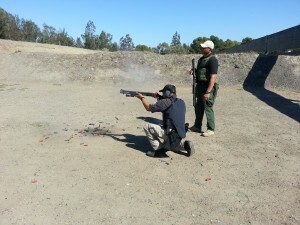 This rig is also ideal for any one running security details if using an AK weapon systems. 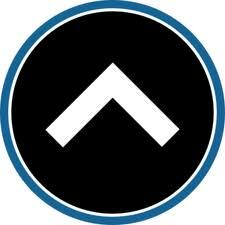 Paladin Services LLC is located in South Carolina, Columbia, Found in 1992 by Joe and Janet Katz. They specialize in helping people learn to protect themselves and their families through CWP( Concealed Weapons Permit) classes and weapons training classes. Janet Katz is a nationally recognized training professional. 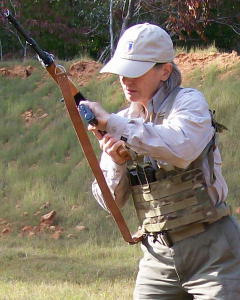 On June 21, 2010, the NRA Womens Programs named Janet "one of our most outstanding trainers." She is SLED-Certified South Carolina CWP Instructor and NRA certified Shotgun,Rifle,Refuse to be a victim, Personal Protection in the home,Personal Protection outside the home instructors and Home firearm Safety Instructor. 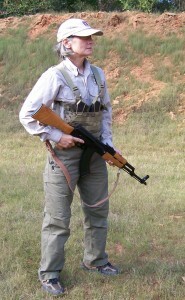 The low profile AK47 chest rig 3 mag version is based upon our 5 mag AK47 chest rig but smaller. The low profile rig is made with the same design, materials and quality construction. Available in the standard or Pull-forward design and a X or H harness. If you are looking for a low profile AK47 chest rig that will support 3 mags this is it. Available in Multicam, A-TACS AU, A-TACS FG, Coyote, Khaki, Ranger Green, OD, Woodland and Black. An A-TACS FG AK chest rig padded harness has been spotted in the Western Washington mountains. The padded harness is a simple solution to add comfort, function, stability, and enhance performance to your BCS chest rig. If you are looking for a way to mount a hydration carrier to your chest rig this is it. 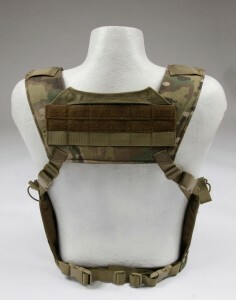 Three rows of molle webbing provide the attachment points need for a hydration system. The 2" of velcro are perfect for ID patches. The low profile drag handle is out of the way but accessable if needed. The AK chest rig padded harness is the ultimate upgrade for you BCS chest rig. 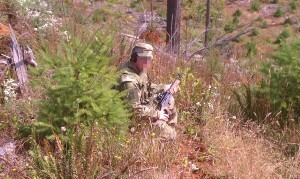 Available in Multicam, A-TACS AU, A-TACS FG, Coyote, Khaki, Ranger Green, OD, Woodland and Black.